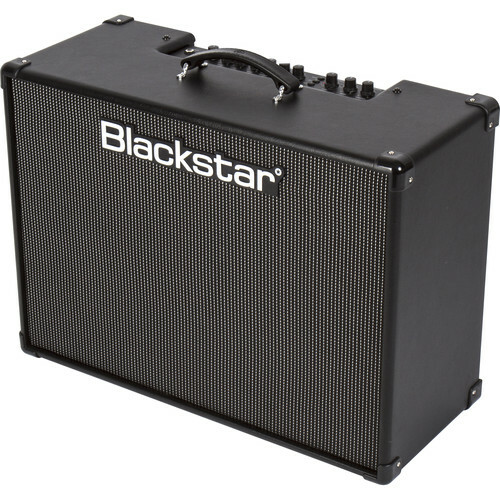 The ID:Core Stereo 150 from Blackstar is a two-channel entry-level combo amplifier for guitar with 75W of power per channel. Its features include twelve stereo effects, six Voice channels, and a stereo MP3/line in for jamming to your favorite tracks or listening to music. The ID:Core combo amplifier features two unique controls which allow you to custom design your own sound. The Infinite Shape Filter (ISF) and the Voice control. The Voice control has the following settings: Clean Warm, Clean Bright, Crunch, Super Crunch, Overdrive 1, and Overdrive 2. Using the Voice control and the ISF together allows for flexibility and ease of use, enabling you to custom design your sound. In addition, the effects section delivers Super Wide Stereo, modulation, delay, and reverb effects simultaneously that you can store with your sound. There is also a built-in Looper and an Octaver effect added to round out the capable effects section. The Blackstar Insider software is used to edit and store up to 36 of your patches which can be uploaded and downloaded via the online community. Finally, a USB connector allows you to record from your amp directly to your computer. A speaker-emulated output completes the package. The ISF control allows you to choose the exact tonal signature you prefer. Fully counter clockwise has a more American characteristic with a tight bottom end and more aggressive middle, and fully clockwise has a British characteristic which is woodier and less aggressive. The voice control has six different channels - Clean Warm, Clean Bright, Crunch, Super Crunch, Overdrive 1, and Overdrive 2. 12 vintage-style studio-quality effects including modulation, delay, reverb, and an Octaver effect with a built-in looper. Stereo MP3/line in can be used for jamming with your guitar or listening to music in Super Wide Stereo.